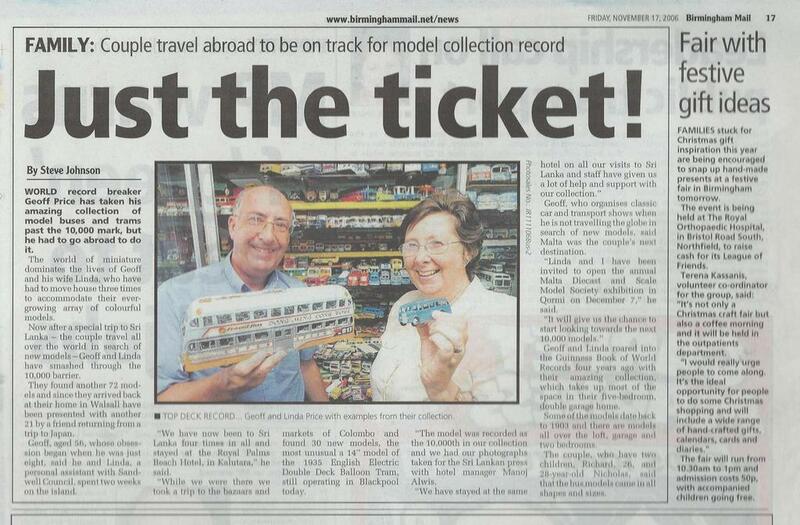 Geoff starting collecting his model buses when he was eight years old in 1958 and since marrying Linda in 1973 they have spent the past forty six years together searching worldwide for different model buses, trams and trolleybuses to add to their ever growing collection which now totals 14,452 different models as at 21st September 2018. 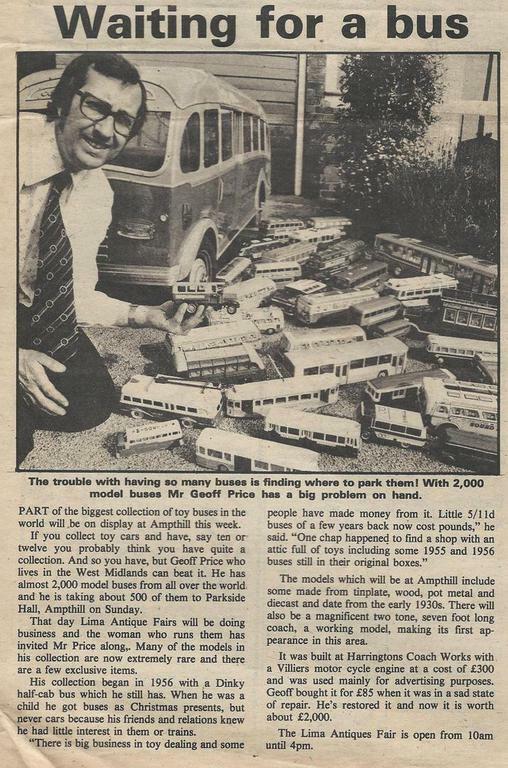 Please note that the contents and information of these pages regarding the Geoff and Linda Price Model Bus Collection has been collated over 46 years from a number of sources - many of the photographs are our own however some have been obtained over this period from other sources. Anyone wishing to reproduce or use any aspect of these pages please email transtar@talk21.com beforehand for permission to do so. 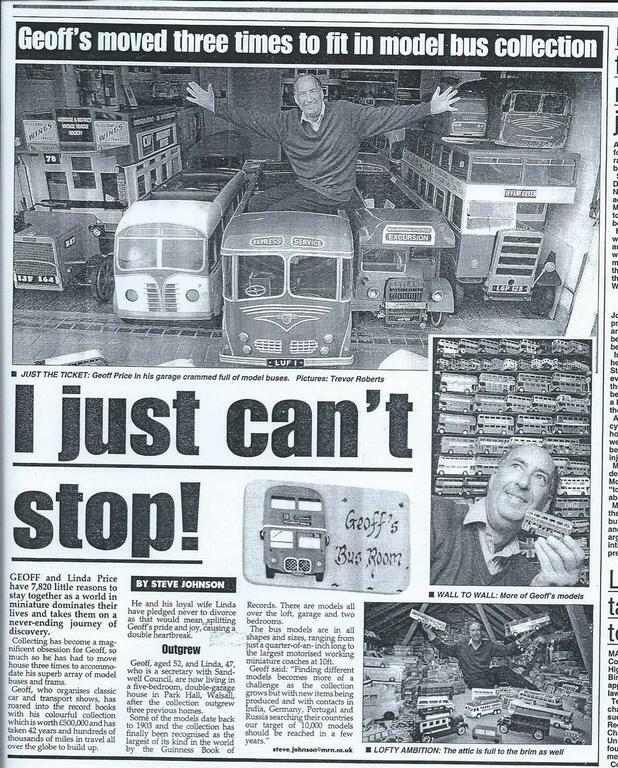 Geoff Price has been collecting model buses, trams and trolleybuses since 1958 when he was 8 years old and since 1973 when he married Linda they have spent the past forty six years searching worldwide for different models to add to their ever growing collection. 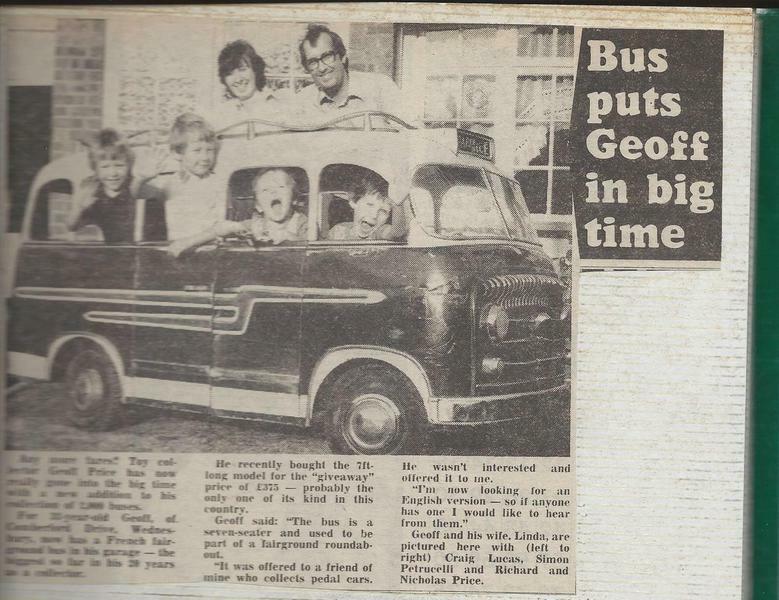 Brought up in the quiet village of Swithland, Leicestershire, surrounded by fields Geoff used to watch the local buses pass by and remembers his parents buying his first Dinky toy bus for Christmas in 1958. 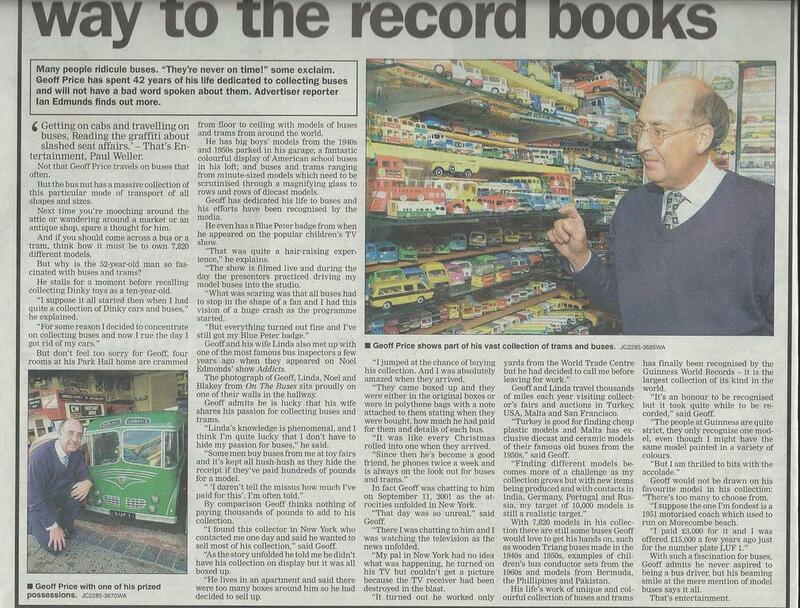 He remembers as a child having Triang toys including the large Triang Double Deck Bus which you sat on. 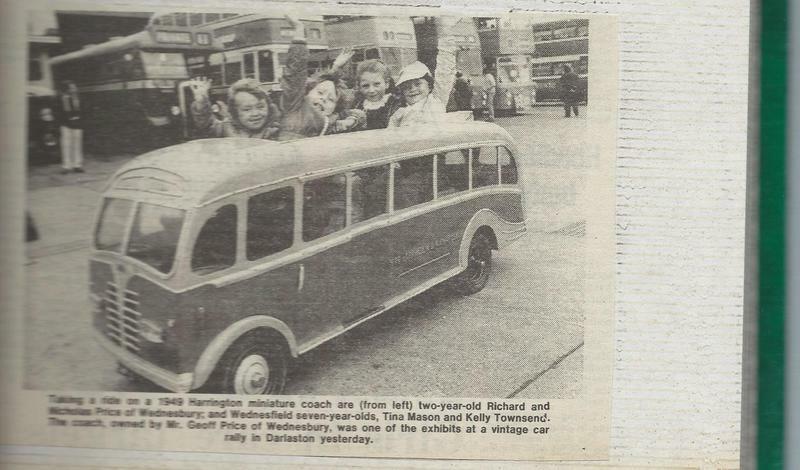 My bus interest continued and I also collected bus tickets, timetables and brochures in the 1960’s along with the toy buses from Dinky, Matchbox, Empire Made plastics plus the Mettoy Coach. At the age of 14 whilst still at senior school I met another enthusiast and before too long a group of us got together and formed a local bus enthusiasts society – still friends today – Pete Newland, Keith Wortley and Peter Blanchard and we obtained our own 1950 Barton Bedford OB which attended various Steam Shows and events. 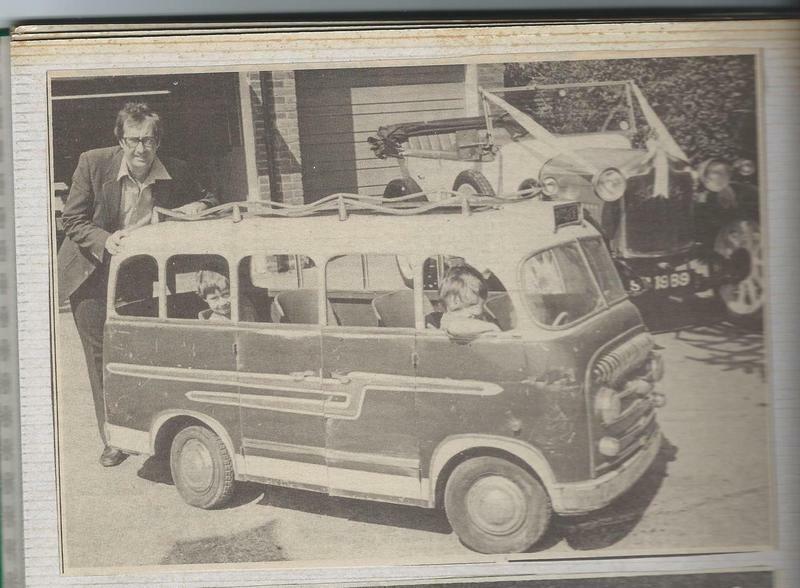 At one of these early events Geoff met up with Joe Weston-Webb who was organising outdoor Old Tyme Festivals and in turn began organising the vehicle elements of his shows for him. In the early 1970’s my work took me to the West Midlands where I met Linda. 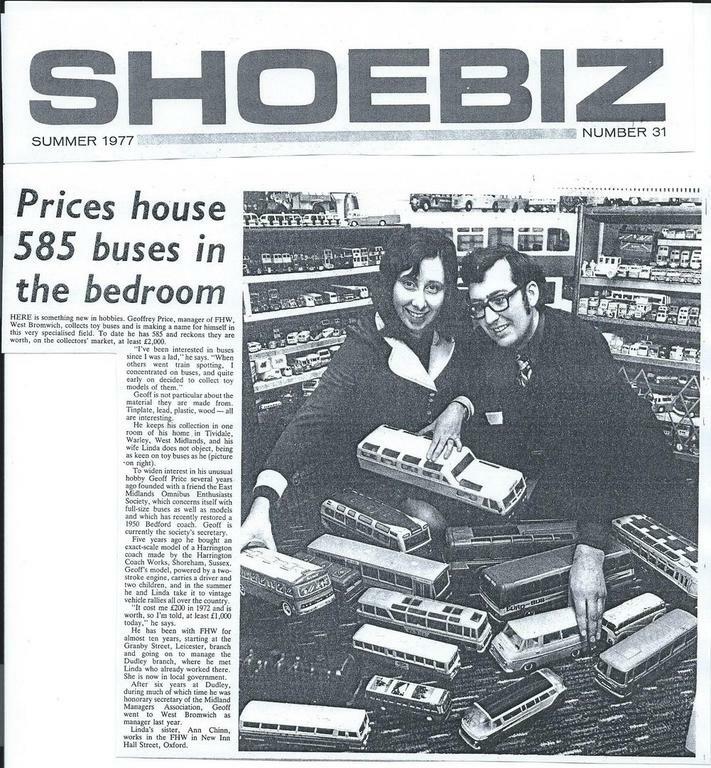 We were married in January 1973 and obtained our own flat which housed the collection of model buses at that time totalling around 300 items. 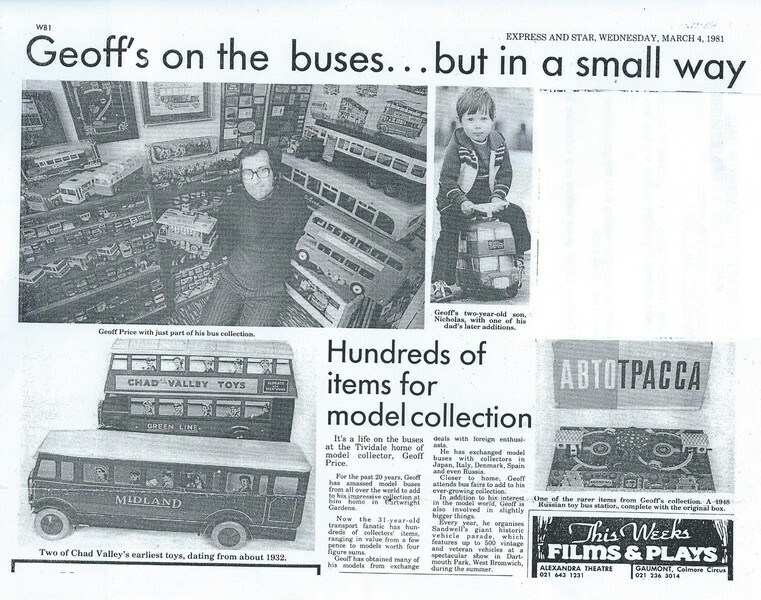 Finding bus models was mainly through the shops and markets and with help from other collectors Geoff decided to look at producing a booklet on all known model buses at the time. 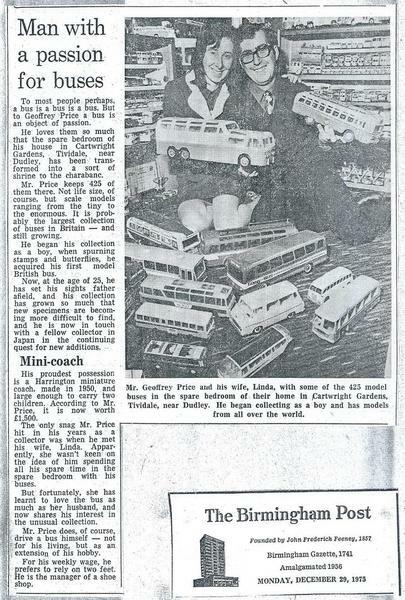 Friends Charles Moate, Mike Rooum, John Gay, Guy Harrison and many others from across the world provided information for this publication which was published by our Bus Society in May 1973 entitled “International PSV Models”. 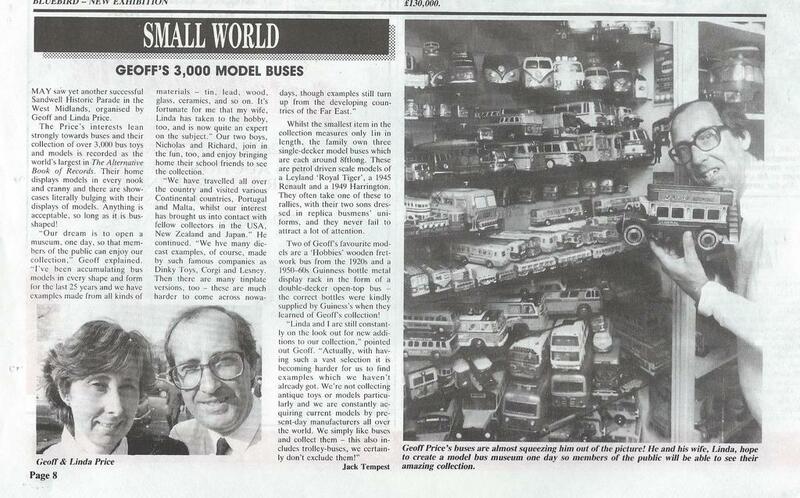 This publication listed around 800 model buses and following the issue of this list additional information was being sent in of models not listed. Although an updated publication was never formally printed it was collated by Geoff and this now forms the comprehensive list Geoff has kept up to date for his reference over the years. 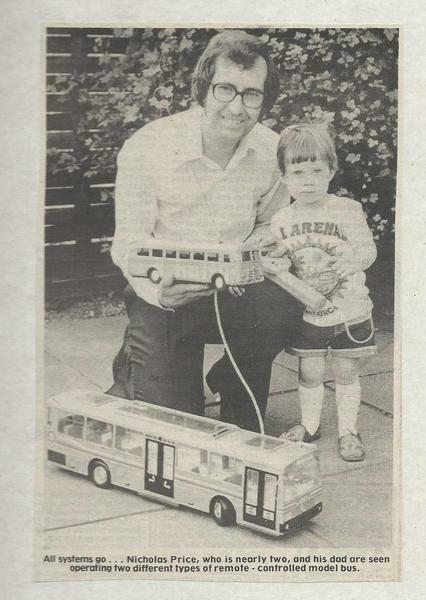 The Birmingham Evening Mail in May 1974 featured Geoff with his collection of “308 replica baby buses” followed by an appearance on BBC Midlands Today with Tom Coyne 14th August 1974. 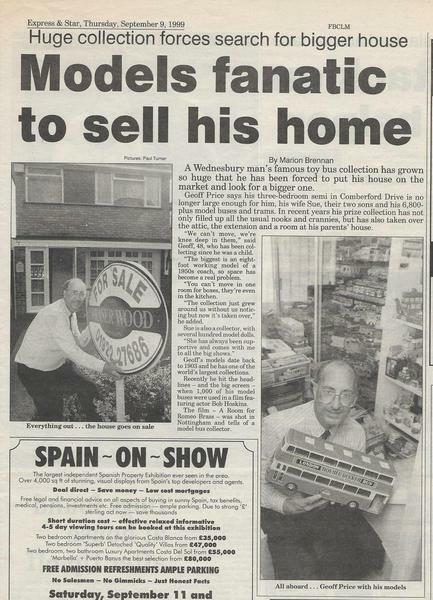 In 1975 we made our first move to Tividale with 423 models. 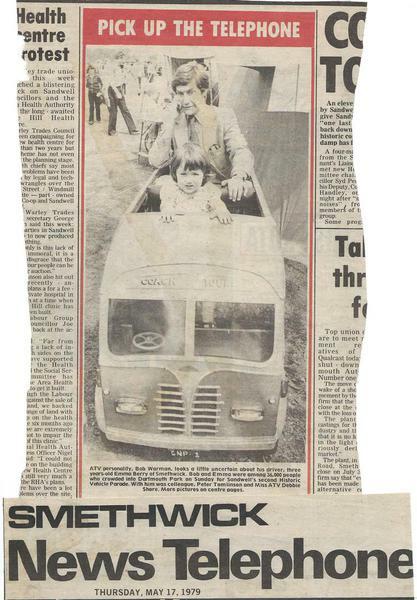 Throughout 1977 Geoff and Linda were planning the first Historic Vehicle Parade in Sandwell which was launched on September 30th and the first event took place on the 14th May 1978 with Geoff and Linda at the helm supported by Sandwell Council for 32 years. Soon after this launch our first child, Nicholas was born in December 1978. Followed by Richard in May 1981. In 1981 following visits to Portugal to visit collectors and purchase models, two of our friends came to stop at our home – Guilherme Victorino and Josie Mellow who lived in Lisbon. 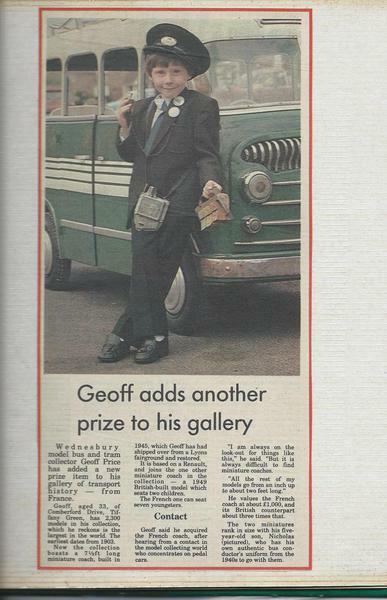 In February 1981 Geoff was invited to attend an exhibition at Headingham, and this resulted in mass publicity throughout Anglia with an appearance live on “About Anglia” the local TV Channel. 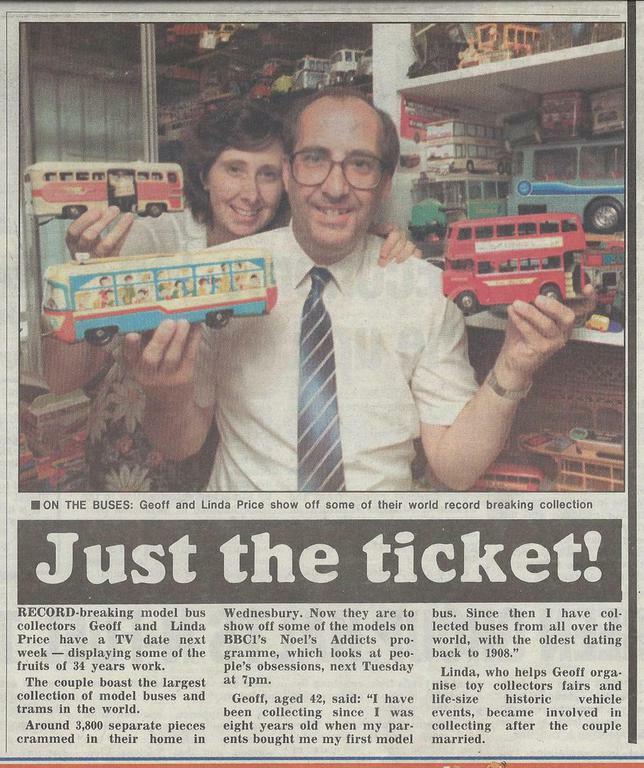 In November 1982 the family made their second move to Wednesbury with around 1,800 buses and converted one of the bedrooms into a model room. 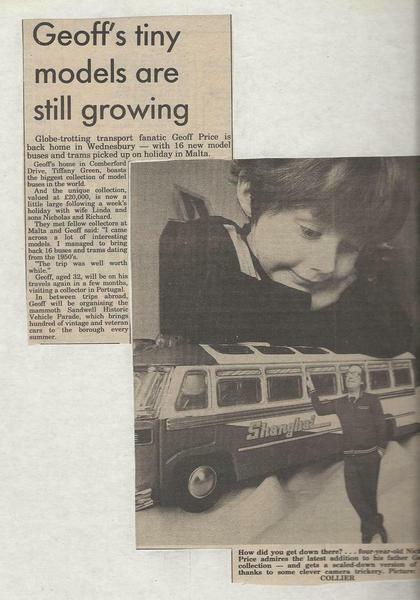 In 1983 they took their children 4yr old Nick and 18 month old Richard on their first trip to Malta and the collection had grown to 1,850 models. The next few years the collection began to grow at a pace with my parents visiting Spain and other countries and always returning with model buses, tinplate, plastic or whatever they could find. 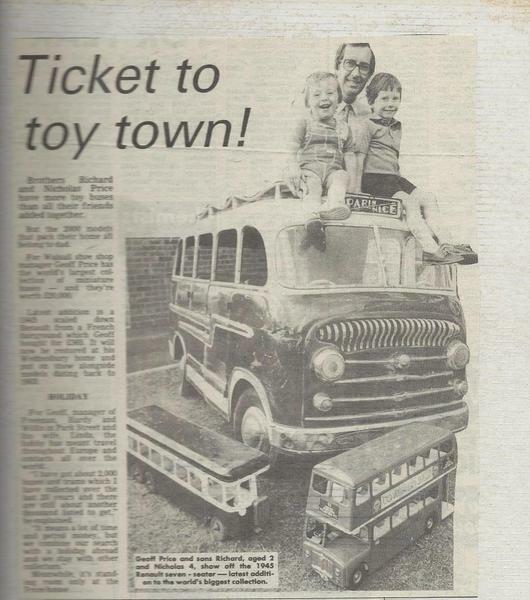 Toy and train fairs started to become popular in England and were a great source for finding model buses with popular events being held in Gloucester, Birmingham and Nottingham and we also started organising our own toy fair at Sandwell. 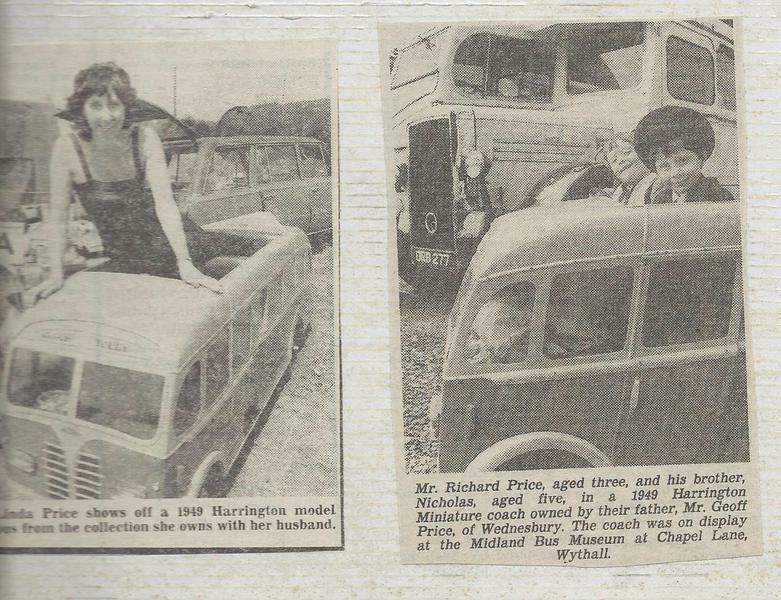 In 1988 we organised the first Festival of Transport at Weston Park, Shropshire and our Leyland Royal Tiger Miniature Coach was used for the publicity and promotion with similar events in Yorkshire and Kent the following year. 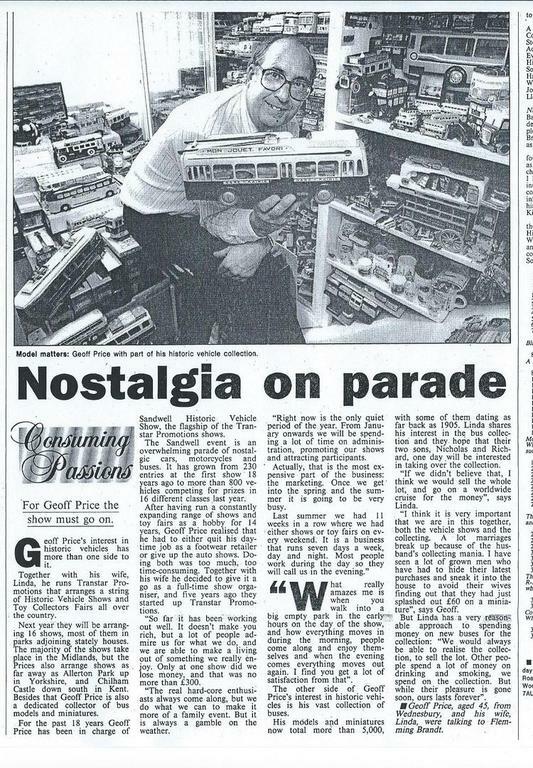 In February 1990 Geoff quit his job and along with his wife Linda formed their own business “Transtar Promotions” extending their event portfolio and continued to add to their collection of over 3,400 models. At one stage they were organising 17 outdoor shows each year. 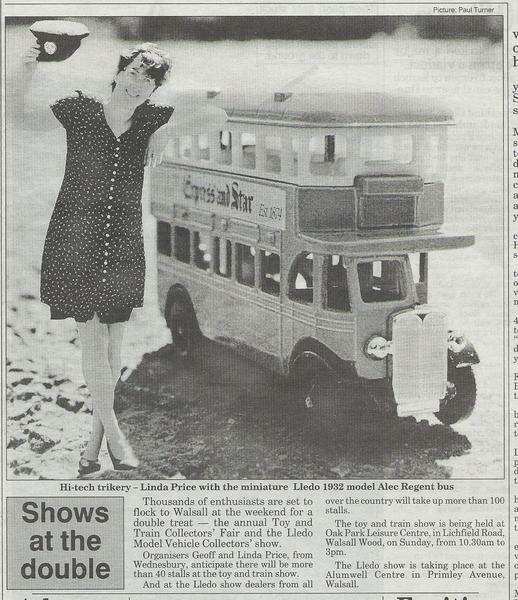 In 1990 the first Lledo Show took place in Sandwell and this started a success story over the next ten years for collectors of this model range and our own toy fairs were being held at Brierley Hill, Cannock, Lichfield, Solihull, Stourbridge, Fox Hollies Leisure Centre. 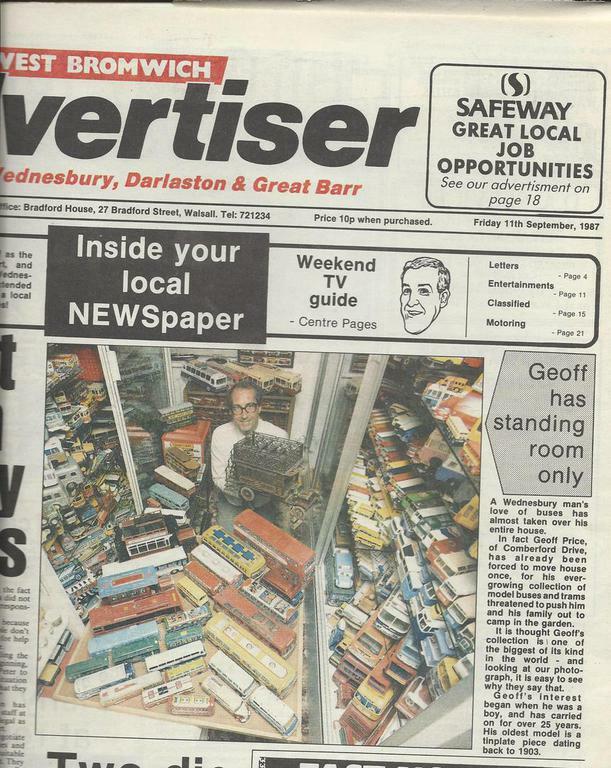 Our Walsall Wood event started on the 23rd June 1991 with 21 stalls and is our only remaining toy fair now in the local calendar for many collectors with over 70+ stalls. On Tuesday 19th May 1992 Geoff and Linda attended BBC TV Studios at Pebble Mill Birmingham to record Noel’s Addicts to be screened on BBC1 23rd June 1992. 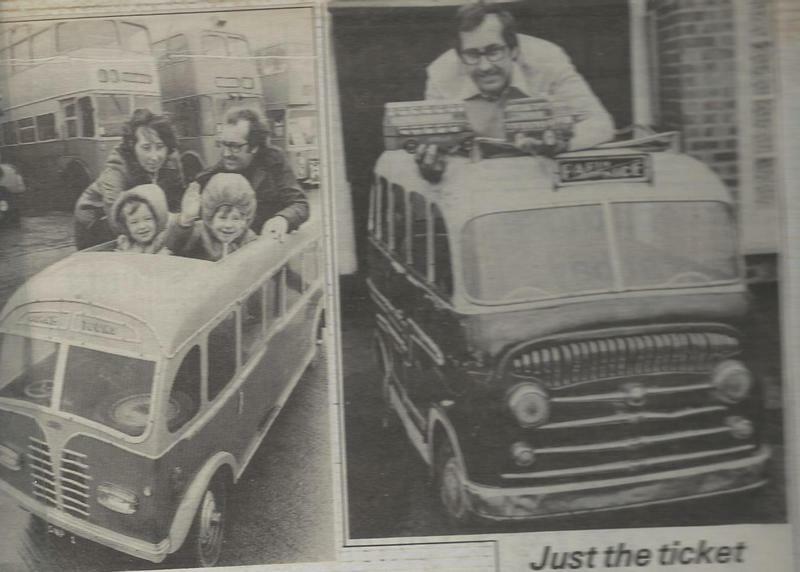 They took along a selection of models from the collection plus the Leyland Royal Tiger Miniature Coach which was featured with Noel Edmonds driving with the Inspector Blakey (Stephen Lewis) star of sitcom “On the Buses”. 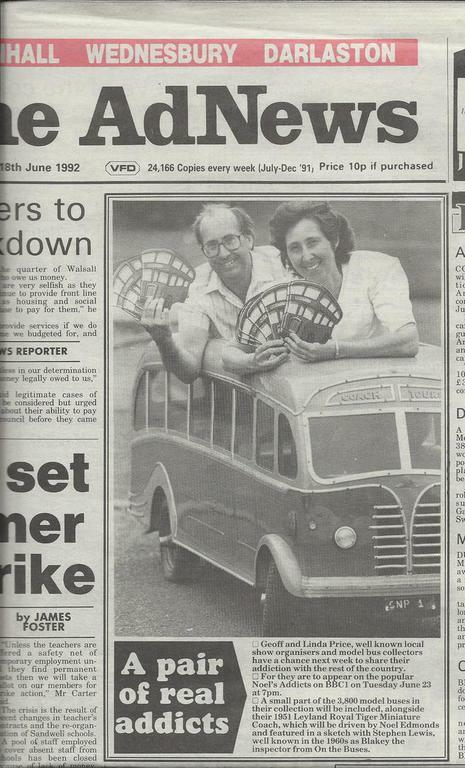 During the 1990’s some collectors were changing direction and in December 1990 Mick Allen from Bristol sold his bus which contained his collection called Coacharama – most of this collection was purchased by ourselves and 41 models were kept for our collection. 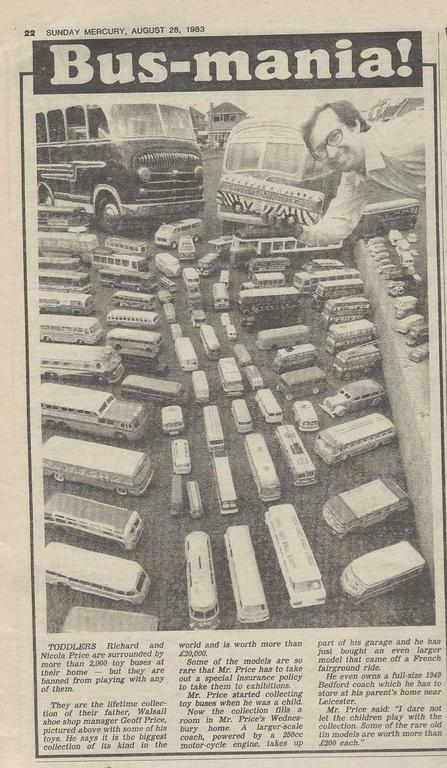 Glenn Brown from New York sold 1,917 to us covering all sorts of American bus models including plastics, card, Christmas decorations plus many other items collected over many years. In 1998 James Stirling passed away and 117 models were obtained from his collection. 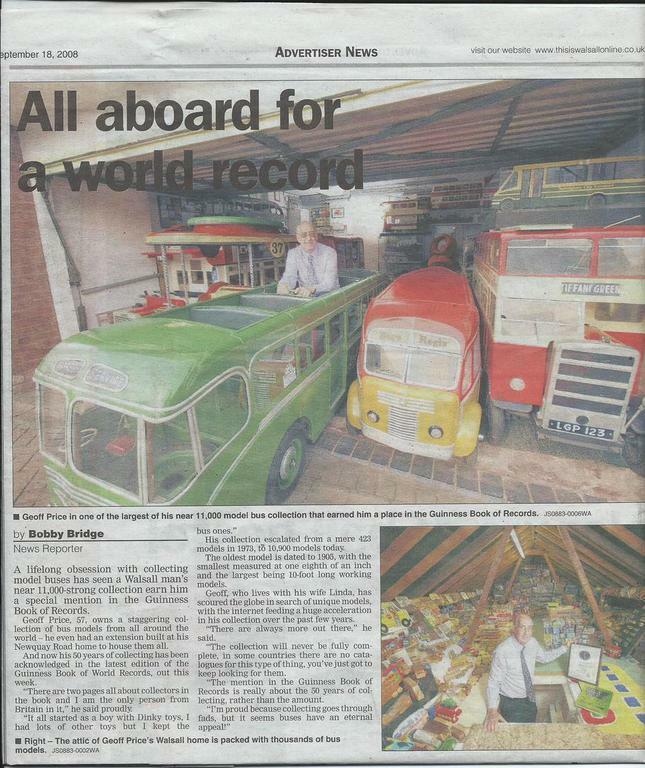 August that year Bob Murray from Leyland down-sized his collection and in October 1999 51 different buses were obtained from a Portuguese collector. Our final move of home to Walsall was in January 2000 when we allocated two model rooms for our 7,015 models. An extension was soon added for more models with a loft and garage space also being used. In 2002 we joined ebay and the internet and what a transformation in both collecting and obtaining information on models. The world had finally come to us but also the problem of more models being located and by 2013, 628 items had been purchased from ebay. In November 2002 one of our largest projects was visiting New York to view the collection of Paul Kantor and we purchased 134 models including cookie jars. This was closely followed in March 2003 when long term friend and collector Casper Bohme invited us to Eindhoven in Holland and we purchased another 120 models. 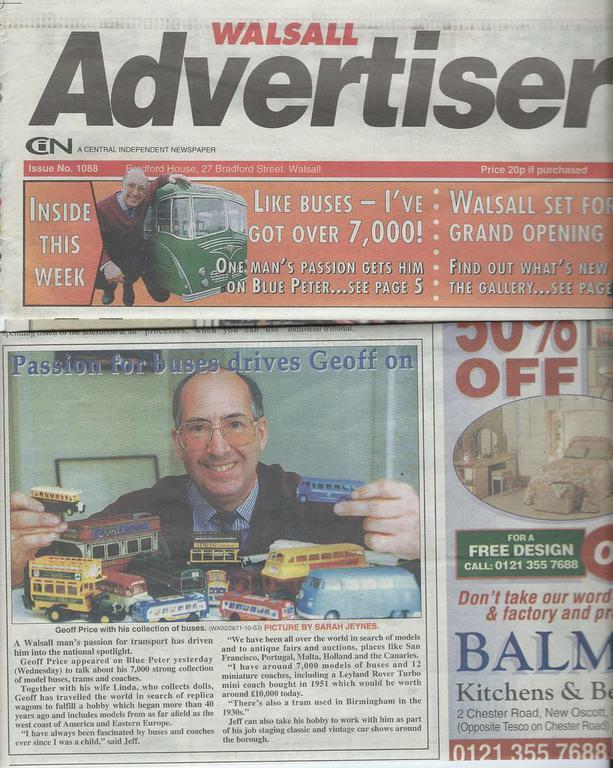 In September 2003 Geoff was given accreditation of being in the Guinness World Records Book 2004 edition for the largest model bus and tram collection in the world. In 2006, 288 models were purchased from Guy Harrison’s amazing collection including pot metal buses and German prisoner of war wooden models. 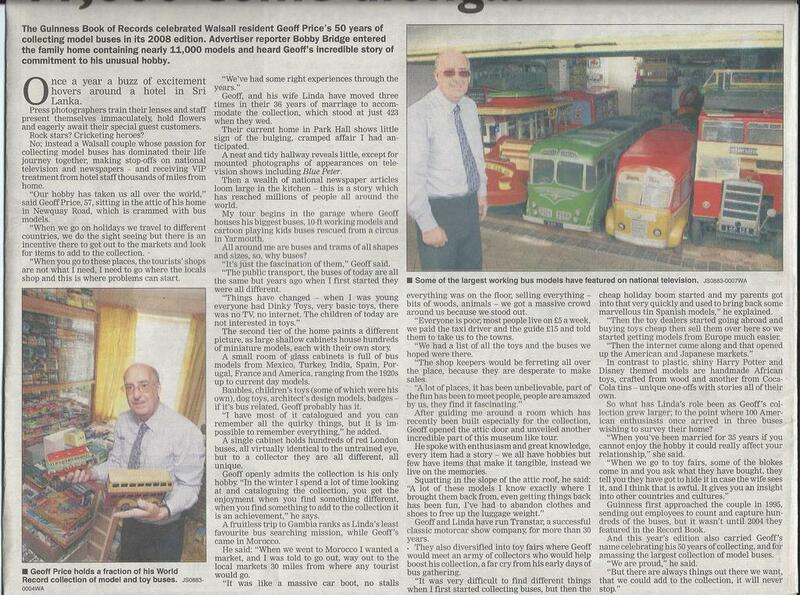 And following our trip to Sri Lanka in September 2008 our collection reached the 10,000 mark. 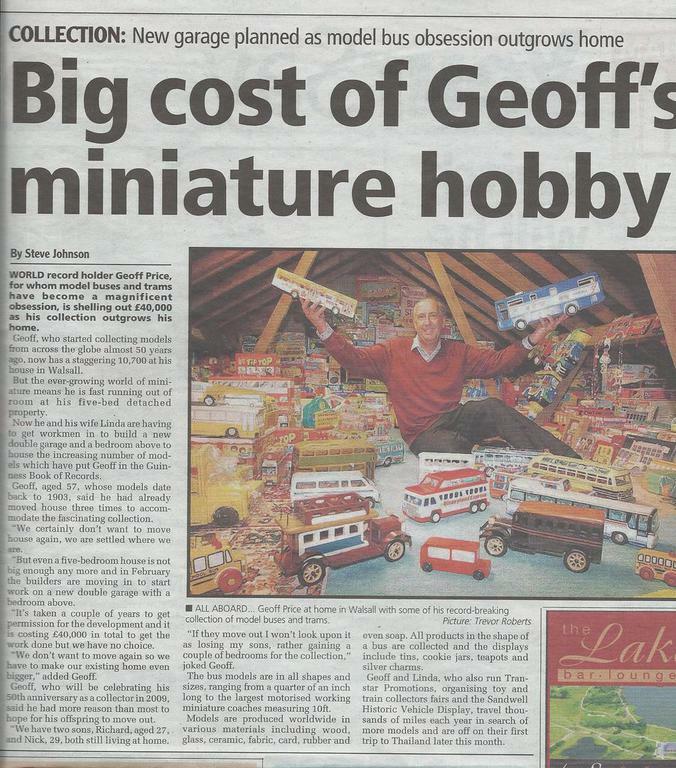 In September 2009 a close collector friend, Les Mason, passed away suddenly – He had amassed a collection of some 6,000 models – Geoff spent a couple of years assisting his widow with the disposal of the collection and obtained 148 models for his own collection. By 2009 the collection had grown to11,358 models. 2010 saw our last involvement with the Sandwell Historic Vehicle Show after 32 years of memories and with over 11,500 exhibitors attracting over 1½million visitors but our other events with Transtar Promotions continued to go from strength to strength including Trentham, Weston Park, Ragley, Dudley, Catton, Walsall, Beaumanor and Shugborough Hall – all of which ran for many years under their banner until they retired from organsing in September 2015. Geoff had been doing them for 45 years and Linda for 43 years when she married him. Over the years the couple had organised hundreds of these popular events the length and breadth of the UK. We continue with our popular Walsall Wood Toy & Train Collectors Fair at Oak Park which we have been organising for over 27 years and since September 2017 is held in the new Oak Park Active Living Centre, Walsall Wood for the forseeable future and carry on with the collection of model buses and miniature coaches and will be attending one or two events throughout the summer months. 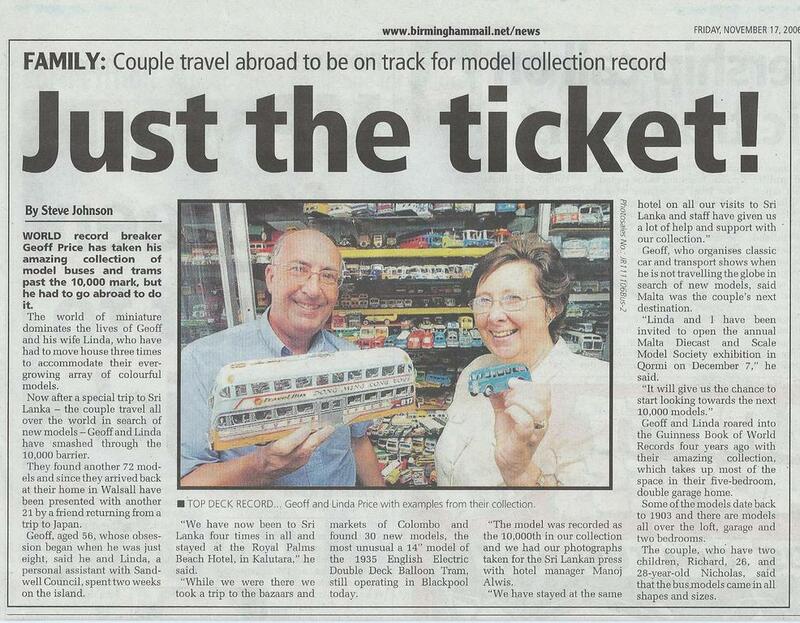 They will of course continue to search for models to add to the collection. 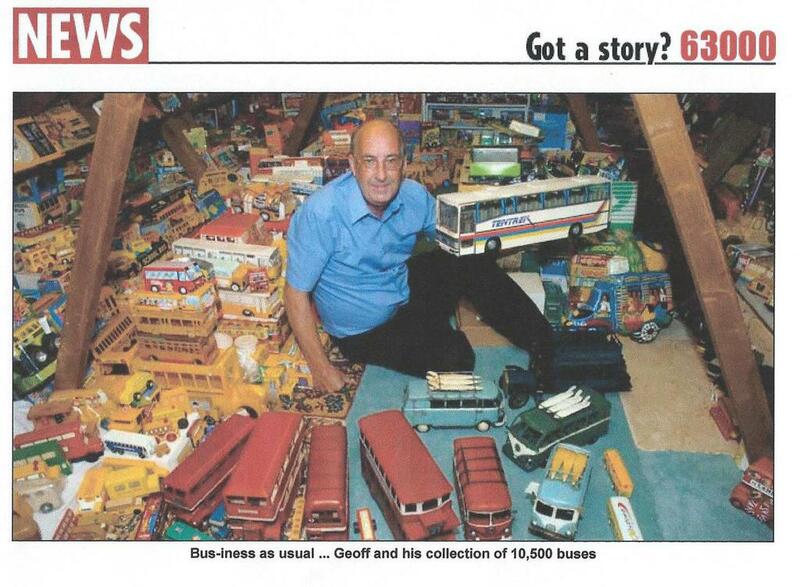 2018 - A special year for Geoff who celebrates 60 years of collecting model buses in October. In January 2018 a number of days were spent with the TV Radio and various newspapers at our home along with the South West News Agency with stories on the collection appearing in the UK and across the World including China, USA, Hong Kong. Our first visit to Hong Kong took place in February where we met up with some of our friends and visited their annual vehicle rally alongside a number of specialist shops selling buses. We are again visting Sri Lanka in late September/October. 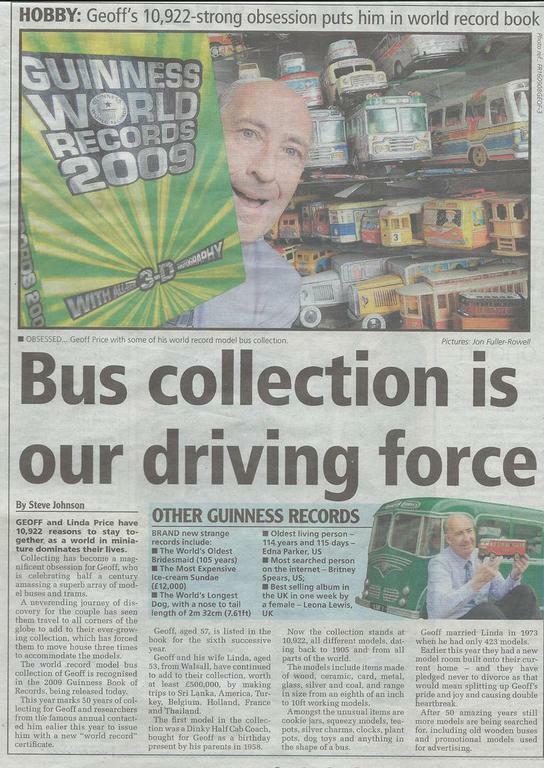 This will be our 15th year and during previous trips obtained 871 different toy buses for the collection. We are looking forward to meeting up with the many friends we have made out there over the years. As an overview we have travelled thousands of miles worldwide putting the collection together over 60 years and many of the items have a story behind them. Also we must thank the hundreds of individuals and collectors for all their help during the time and acknowledge the privilege we have had in obtaining items for our collection from previous collectors who have disposed of models.